Weekend trips to Disney World can be a lot of fun and a great option for those unable to manage a longer trip. A 3- to 4-night Disney vacation gives visitors a glimpse of the Disney magic and is perfect for packing light. Did I really just suggest packing light for Disney World? Yes, I did. 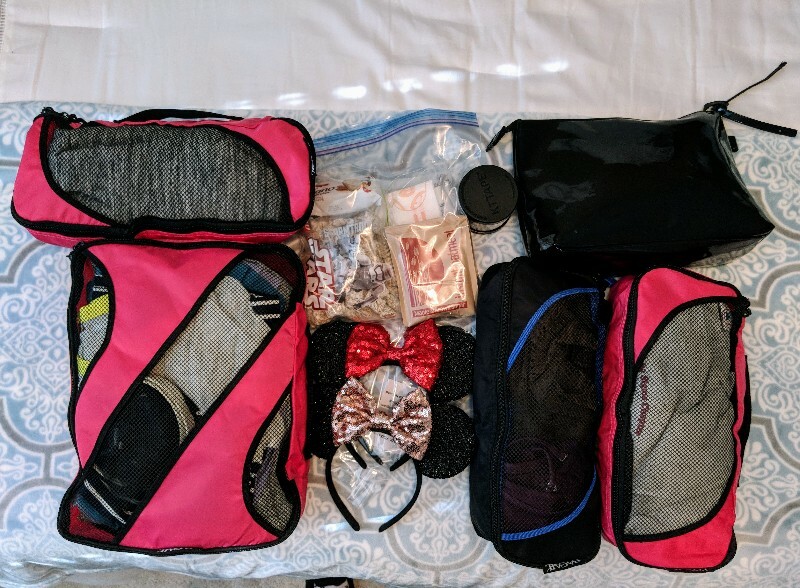 You really can pack light for Disney World using carry-on luggage only. 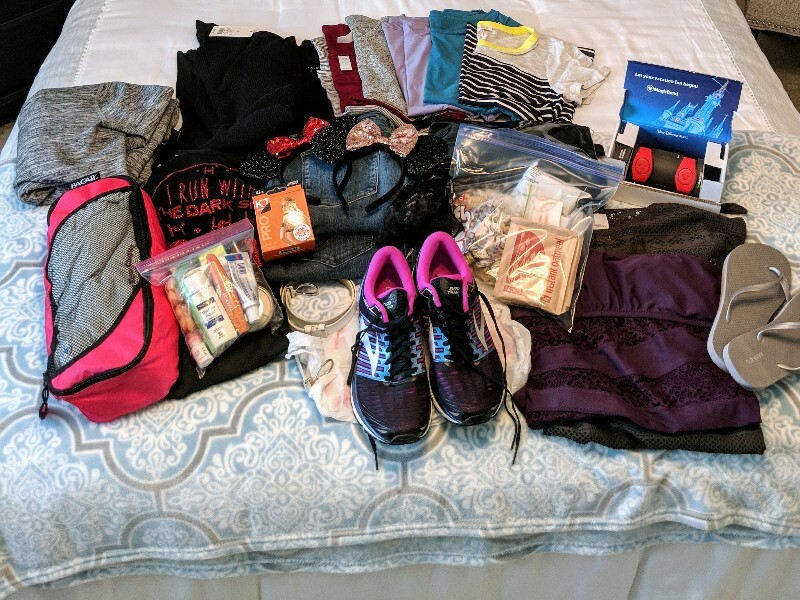 Today I’ll share with you how I pack light for Disney World (including a runDisney weekend). I always pack clothing in a coordinating color scheme. This allows easy mixing and matching of all tops and bottoms. Packing necklaces and/or a thin scarf provides variety to my outfits without needing much suitcase space. It is shocking how easily an accessory changes an outfit! You must be ruthless when packing shoes and toiletries in a carry-on when packing light for Disney World. Shoes are a huge space waster in a carry-on suitcase. I like to wear my main shoes for the trip on the plane (Converse All-Stars are my favorite). I also pack a pair of sandals or flip flops for dinners at the resort or going to the pool. The only time I have packed a third pair of shoes was when it was absolutely necessary for my runDisney event. I ordered a set of 1-ounce bottles from Amazon (affiliate link: buy on Amazon) and found they are the perfect size for this length trip. I don’t bother packing shampoo, conditioner, or body wash when packing light for Disney World, but instead use what’s supplied at the resort. You can bring your own solid bar of soap if you prefer, since that doesn’t count toward your liquid limits. Please note: Value resorts do not provide body lotion, so definitely pack your own. I usually need one carry-on roller bag per person. I have fit all of my and Elizabeth’s items in one roller bag for a 3 night trip in hot weather, but that is not the norm even for us. You may be able to use one bag for 2 young children since their clothing tends to be smaller. It is possible to fit all of these items in my carry-on roller bag. I think this carry-on suitcase we own is truly magic. It holds an amazing amount of stuff and complies with Southwest Airlines baggage limits (affiliate link: buy on Amazon). Make sure to check the exact carry-on requirements for the airline you will be using to avoid last-minute issues at the gate. Entertainment for the plane such as books, magazines, phone, laptop, and headphones get added to my park bag which doubles as my personal item for the plane. 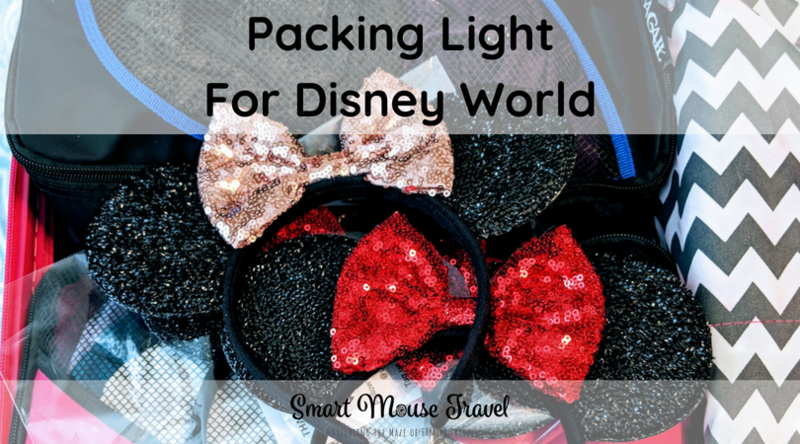 Make sure you review my park bag packing to avoid forgetting important Disney park essentials. Pro tip: I place my bag with liquids inside my personal item park bag for easy access when going through security. Once I am done I then move the 3-1-1 bag into my roller bag. Packing cubes make it a lot easier to fit all of these items into your carry-on luggage. Carefully fold your items so that there is no wasted space in each cube. You will fit a lot more than you think into each cube! Using packing cubes is also a great way to organize items. For example: pajamas, undergarments, and socks go in one cube, clothes in another, and all our swim gear in another. Then you know exactly where to find the things you need. These are the packing cubes we consistently use for our trips (affiliate link: buy it on Amazon). Game time! Now it is time to play suitcase Tetris! You may have to try different configurations to find the one that uses the space in your bag most efficiently. I have grown really fond of packing light for Disney World in just a carry-on. Packing light can save money (if your airline charges for checked bags), time (if you are collecting your own baggage), and hassle (less luggage means easier travel). However, there is no shame in needing to check a bag. 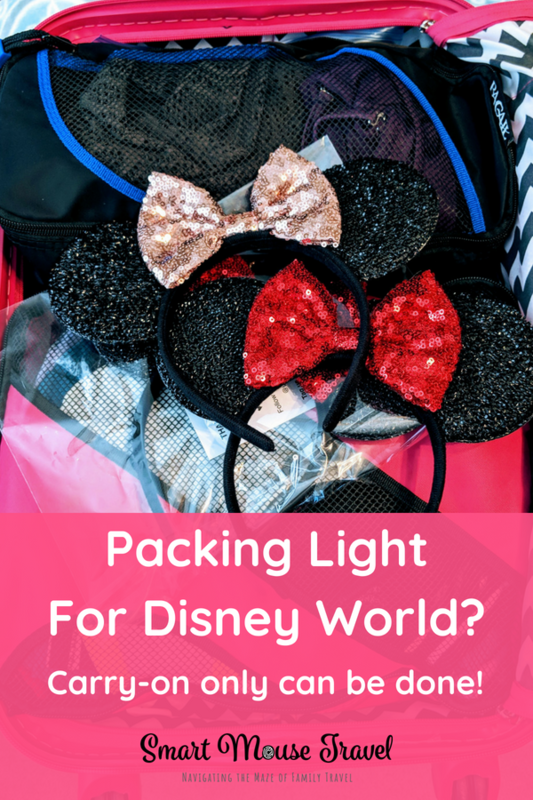 In fact, I have an extremely comprehensive Disney World packing list that you can use (with a free printable) if you don’t think packing light for Disney World is for you. Disney’s Magical Express also makes checking a bag easy by picking up your luggage for you at Orlando International Airport. Find out more in my guide to Disney’s Magical Express. Will you be team carry-on or checked bags or your next Disney trip?